The late Chalmers Johnson often reminded us that "A nation can be one or the other, a democracy or an imperialist, but it can't be both. If it sticks to imperialism, it will, like the old Roman Republic, on which so much of our system was modeled, lose its democracy to a domestic dictatorship." His warning rings more true by the day, as Americans watch the erosion of their civil liberties accelerate in conjunction with the expansion of the US Empire. When viewed through the lens of Johnson's profound insights, the Supreme Court's recent ruling in Kentucky v. King makes perfect sense. On May 13, in a lopsided 8-1 ruling, the Court upheld the warrantless search of a Kentucky man's apartment after police smelled marijuana and feared those inside were destroying evidence, essentially granting police officers increased power to enter the homes of citizens without a warrant. Under the Fourth Amendment, police are barred from entering a home without first obtaining a warrant, which can only be issued by a judge upon probable cause. The only exception is when the circumstances qualify as "exigent," meaning there is imminent risk of death or serious injury, danger that evidence will be immediately destroyed, or that a suspect will escape. However, exigent circumstances cannot be created by the police. The Kentucky Supreme Court had overturned the man's conviction and ruled that exigent circumstances did not apply because the behavior of the police is what prompted the destruction of evidence. Tragically, an overwhelming majority of the Supreme Court upheld the Conviction. Writing for the majority, Justice Samuel Alito wrote that citizens are not required to grant police officers permission to enter their homes after hearing a knock, but if there is no response and the officers hear noise that suggests evidence is being destroyed, they are justified in breaking in. In her lone and scathing dissent, Justice Ruth Bader Ginsburg agreed with the Kentucky Supreme Court, arguing that the Supreme Court's ruling "arms the police with a way routinely to dishonor the Fourth Amendment's warrant requirement in drug cases. In lieu of presenting their evidence to a neutral magistrate, police officers may now knock, listen, then break the door down, never mind that they had ample time to obtain a warrant." She went on to stress that "there was little risk that drug-related evidence would have been destroyed had the police delayed the search pending a magistrate's authorization." Not only did the police instigate the destruction of evidence by banging at the door and shouting "Police, police," but they could have easily obtained a warrant since they likely had probable cause. There is no reason to believe that delaying the search to obtain a warrant, as legally required, would have led to the destruction of evidence. This was pure laziness and contempt for the constitution on part of the officers. An argument could be made that entering without a warrant saves money, time, and resources, especially if it's obvious that a crime is being committed. However, the protection of our rights is worth the money, time, and resources. Living in a free society requires that we make these sacrifices, even at the peril of our safety if need be. In fact, I would argue that the wasting of money, time, and resources is the fault of a deeply flawed drug policy, not the protection of those pesky civil liberties always getting in the way of law enforcement. As for the implications of such a ruling, arming the police with more power will have serious consequences for an already institutionally biased criminal justice system in regards to the "war on drugs." Jordan C. Budd notes the existence of a "poverty exception" to the Constitution, particularly the Fourth Amendment, a bias that renders much of the Constitution irrelevant at best, and hostile at worst, to the American poor. While attacks on the Fourth Amendment negatively affect all members of society, minorities and the poor, generally the targets of the drug war, are more vulnerable to the abuse of power that follows. "Poor people are entitled to privacy, even if they can't afford all the gadgets of the wealthy for ensuring it. . . . When you glide your BMW into your underground garage or behind an electric gate, you don't need to worry that somebody might attach a tracking device to it while you sleep. But the Constitution doesn't prefer the rich over the poor; the man who parks his car next to his trailer is entitled to the same privacy and peace of mind as the man whose urban fortress is guarded by the Bel Air Patrol. . . .We are taking a giant leap into the unknown, and the consequences for ourselves and our children may be dire and irreversible. Some day, soon, we may wake up and find we're living in Oceania." The same holds true in the context of warrantless door-busting. In the Kentucky case the police smelled marijuana in the hall of the apartment complex that the initial suspect they were tracking had taken refuge in. An apartment hall is a common space shared by many people, who could be emitting various odors from inside their homes, such as cooked onions or fresh paint. Had this been a single-family home in the suburbs, there is no way the smell of pot would have been detected from the doorway of the house across the street. "As with the broader drug war, civil-liberties violations have a disparate impact in terms of race and class. It is generally not wealthy white suburbanites who have to worry about being stopped and frisked on the streets or having their doors broken down. Like the grotesquely harsh sentencing disparity between powder and crack cocaine possession, this erosion of Fourth Amendment rights has persisted because wealthy people are largely insulated from its effects." The failure of society at large to secure the rights of all segments of the population, has resulted in what can only be described as a nail in the coffin of our right to privacy, at least for those who can afford it. In her dissent, Ginsburg went on to ask, "How 'secure' do our homes remain if police, armed with no warrant, can pound on doors at will and, on hearing sounds indicative of things moving, forcibly enter and search for evidence of unlawful activity?" While I agree with Ginsberg's premise, I would go further in arguing that the war on drugs has created a dangerous precedent where even when a search warrant is obtained, we are far from secure in our homes. For example, about a week prior to the Kentucky ruling, police authorities in Pima County, Arizona, fired 71 shots in seven seconds at 26-year-old Jose Guerena, a former Marine who served two tours in Iraq. Guerena was murdered in the middle of the night while his terrified wife and 4-year-old son hid in the closet. The SWAT team that killed him was there to serve a narcotics search warrant as part of a multi-house drug crackdown. As Guerena lay dying with his wife pleading for help, the SWAT team barred paramedics from entering the home. Guerena's wife asserts that her husband grabbed his gun because he thought his family was the victim of a home invasion, not a police raid. This is understandable given the family's location in Arizona, a state where anti-immigrant militants are notorious for the cold-blooded murder of hispanic families. Deputies initially justified their actions by claiming that Guerena fired at officers but later said he kept the gun safety on and never pulled the trigger. As it turns out, Guerena's murder is just the most recent in a long line of botched paramilitary operations. According to an investigation carried out by the CATO Institute, America has seen a disturbing militarization of its civilian law enforcement over the last 25 years, along with a dramatic and unsettling rise in the use of paramilitary police units for routine police work. In fact, the most common use of SWAT teams today is to serve narcotics warrants, usually with forced, unannounced entry into homes. 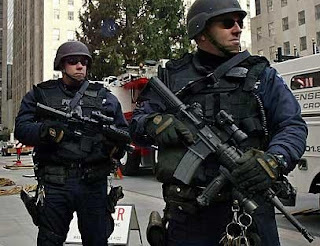 The CATO study found that some 40,000 of these raids take place every year, and are needlessly subjecting nonviolent drug offenders, bystanders, and wrongly targeted civilians to the terror of having their homes invaded while they're sleeping, usually by teams of heavily armed paramilitary units dressed not as police officers but as soldiers. "These raids bring unnecessary violence and provocation to nonviolent drug offenders, many of whom were guilty of only misdemeanors. The raids terrorize innocents when police mistakenly target the wrong residence. And they have resulted in dozens of needless deaths and injuries, not only of drug offenders, but also of police officers, children, bystanders, and innocent suspects." Those who suggest that the Supreme Court's decision in Kentucky v. King is "no big deal" or that it's "alarmist" to think otherwise, must not understand the extent to which the boundaries are pushed when the Court makes exceptions to our rights. Nor do they comprehend that once lost, civil liberties are impossible to reclaim. With SWAT teams already injuring and at times killing the wrong people to serve warrants, just imagine the abuse to come given the increased power the Court has bestowed upon the state. Considering the level of brutality we have been dishing out around the world, from the "war on drugs" to the "war on terror," the erosion of our civil liberties is sadly inevitable. Did we really think that we could wage war and occupy other nations with checkpoints, invasive surveillance, and brutal violence without these same policing tactics spreading to our country? After sending hundreds of thousands of soldiers abroad to terrorize people in their homes around the world, we shouldn't be surprised that our government would eventually employ the same actions against its own citizens. Just as Chalmers Johnson predicted, our imperialism abroad is destroying what is left of our democracy at home. From warrantless wiretapping to warrantless door-busting, this is what a police state looks like. America needs to wake up and realize we are living in a police state similar to the Gestapo in Germany during WWII and the SWAT are more like the SS. i am 67 and i have never seen anything like today where the police beat and even kill citizens as they do today across the US.Arresting people for tapeing an arrest. What are they afraid of because they have the guns and other weapons.I was brought up to respect the police but that has changed. I hope parents teach their children to stay away because they are no longer our friend. The American Epidemic of Obesity? What if you had to buy American? Inside the GOP's "Security Act"
So bin Laden's dead. Where do we go from here? Obama “GOT” Bin Laden Now What About Bush? Are we gonna get our rights back? Chemtrails: What In The World Are They Spraying?